The Met Office has issued a weather warning for snow and ice in Yorkshire and the Humber. 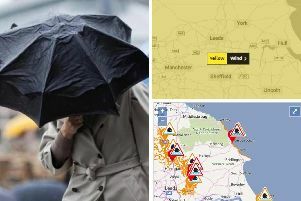 The yellow “be aware” warning is valid from 12.10am to 10am on Friday. A Met Office spokesperson said: “A weather system will cross to the south of this region early on Friday. “This will bring rain to many areas but snow is likely over some of the higher ground, such as the Pennines and Southern Uplands, and rain may turn to snow at lower levels before it clears eastwards. “The snow may be heavy in places, possibly giving 2-5 centimetres at low levels and maybe 10 centimetres or more above around 200 metres. The spokesperson said the public should be aware of the potential of disruption to travel and also of hazardous driving conditions.